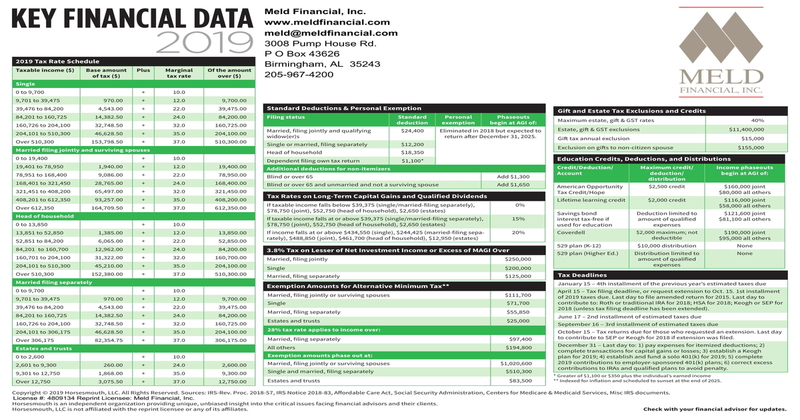 Key Financial Data for 2019 | Meld Financial, Inc.
Our handy reference guide of 2019 financial data. This guide includes exemptions, deductions, tax brackets, Social Security information, Medicare benefit information and retirement plan contribution limits. It also contains useful financial information for attorneys, CPAs and other professionals. Click the image below to download the .pdf file.